At Fukushima, the amount of long-lived, highly radioactive Cesium-137 is about 134 million curies — roughly 85 times the amount of Cs-137 released at the Chernobyl accident, as estimated by the U.S. National Council on Radiation Protection (NCRP). 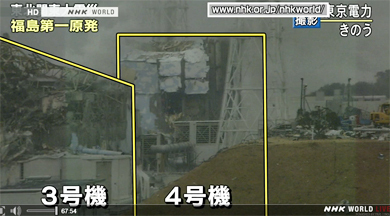 Hole is showing in the wall of Unit # 4 on March 16, 2011, that has been on fire at Fukushima Dai-ichi nuclear power plant, Japan. 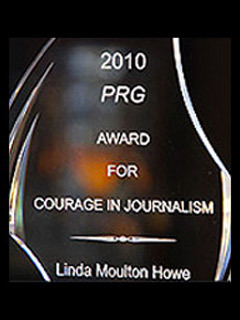 Image © 2011 by NHK World TV news. 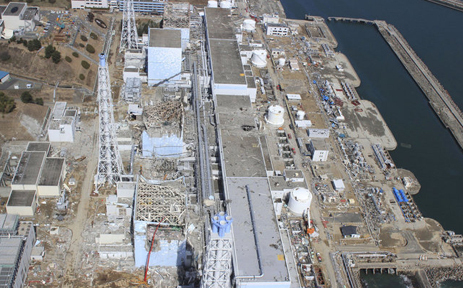 March 24, 2011, Unit 4 in foreground after explosions and fires that followed the March 11, 2011, massive 9.1 earthquake and tsunami. There are 1,231 irradiated spent fuel rods in the spent fuel pool of Unit 4, which contain roughly 37 million curies (~1.4E+18 Becquerel) of long-lived radioactivity. The Unit 4 pool is about 100 feet above ground, is structurally damaged and is exposed to the open elements. If an earthquake or other event were to cause this Unit 4 pool to drain, this could result in a catastrophic radiological fire involving nearly 10 times the amount of Cs-137 released by the Ukraine's Chernobyl Nuclear Power Plant meltdown on April 26, 1986. April 8, 2012 Fukushima, Japan - Japan’s former Ambassador to Switzerland, Mr. Mitsuhei Murata, was invited to speak about the Fukushima nuclear power plant disaster at a public hearing of the Budgetary Committee of the House of Councilors on March 22, 2012.